This easy-to-make soup recipe is both remarkably delightful to the palette and nutritiously beneficial for our health. My mother made this Chinese Yam and Goji Pumpkin Pork Soup for the family one evening and it quickly became the highlight of that dinner. We love this soup from Mom, and I hope you will enjoy her recipe as well. This soup offers a clean savory sweet taste, and an appealing ensemble of colors to greet the eyes. Biting into the Kabocha pumpkin cooked in my mother’s recipe (as my dad accurately described) is like biting into the nice soft yolk of a salted egg you would find in a Chinese mooncake. 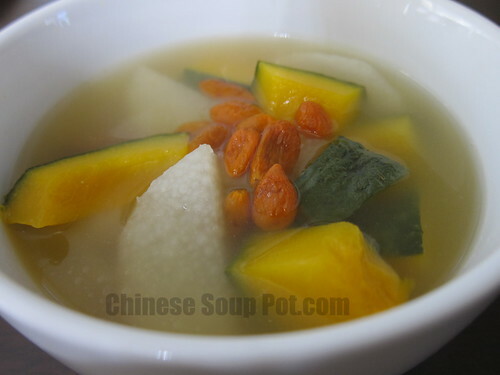 With key ingredients like the chinese yam, kabocha pumpkin, and goji (wolfberry), this soup is a delicious way to take in natural beta carotene, vitamin C, and minerals like iron and potassium. The soup also gently tonifies the Qi without causing heat or injuring the Yin. Enjoy! Cut the lean pork to 2" chunks, and mix in the tsp of salt. Let sit for 15 mins. Bring 12 cups of water to boil in a big soup pot. In the meanwhile, rinse and soak the honey dates and wolfberries. Peel and cut the Chinese Yam to ½" slices. In a separate smaller pot, boil a small amount of water to blanch the pork. When the big pot of water boils, add in the ginger slices, blanched pork, and honey dates. Bring the water to a boil again on high heat, then reduce the heat to a low simmer. Set the timer for 2 hours of cooking over low heat. In the meanwhile, wash and cut the kabocha pumpkin in half. Scoop out the seeds with a spoon, and cut to 2" chunks with the skin on. Set aside. When the timer signals, add all remaining ingredients to the boiling pot and cook on low heat for another 20 minutes once the liquid boils again. Serve. 1. See the Chinese Yam, Kabocha pumpkin, goji (wolfberry), and ginger root pages in the Common Ingredients section for their health benefits, preparation, and buying tips. We would be delighted if you could add your blog to Petitchef so that our users can, as us, enjoy your recipes. Petitchef is a french based Cooking recipes Portal. Several hundred Blogs are already members and benefit from their exposure on Petitchef.com. I am both very flattered and humbled by your compliment and invitation to join petitchef. I will certainly check it out and let you know offline. What a healthy and hearty soup! I love the simple recipe like this and I can enjoy this every meal until it’s gone…. This soup sounds very sweet and delicious. Can you please explain the difference in honey dates verses the red dates and their uses and health benefits? I love your website!! Hi Bobbi / Bam’s Kitchen, thanks for your question. Red dates are slightly warm and they tonify the blood (補), while honey dates nourishes / moistens. Honey dates are also much sweeter than red dates. Hence, honey dates are used in this recipe to keep it neutral and to enhance the sweetness of kabocha pumpkins. Look for more updates in my Common Ingredients section for additional introductions of Chinese herbs and food ingredients. Thanks again for visiting! I fell in love with Chinese yam this past summer when I was in China, I had the most delicious steamed dessert made with it! I wish I had better Asian markets in Cleveland, but I’ll definitely have to try to get my hands on the ingredients for this soup. Thanks for your explanation regarding red dates vs honey dates. Yum! So easy & nutritious. 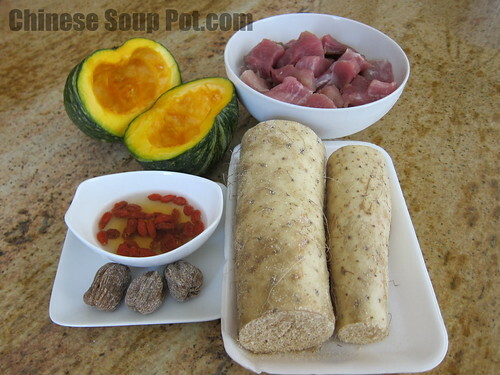 We usually use pork rib to cook a similar kind of soup. I think I’ll try lean pork next. Get to enjoy the meat at the same time. This soup looks wonderful! I love kabocha squash, and have recently tried goji berries and mmmmmmmmmhhhh!!!!!! I’ve been in a soup-making rut for a while now. So glad I found this site and this particular recipe! I think I’ll be using dried chinese yam instead of fresh just because it’s easier to find. Can’t wait! I am so glad that you found this site too! Dried Chinese Yam is certainly an excellent alternative to the fresh ones. I hope you enjoyed the soup!